Railpictures.ca - Stephen C. Host Photo: It’s hard sometimes to think of the scale of what we photograph, but trains are actually quite large. This photo should put it into perspective, as ‘house sized’ QGRY 2301 passes a dwelling at the corners of Rose and Port St in Brantford, at 0800 back in 2015. One can’t mistake the correlation between the safety vest of SOR 598′s conductor and the paint on QGRY 2301. A friend called G&W the “Safety Vest Railway” and I agree. | Railpictures.ca – Canadian Railway Photography – photographie ferroviaire Canadienne. Caption: It's hard sometimes to think of the scale of what we photograph, but trains are actually quite large. This photo should put it into perspective, as 'house sized' QGRY 2301 passes a dwelling at the corners of Rose and Port St in Brantford, at 0800 back in 2015. One can't mistake the correlation between the safety vest of SOR 598's conductor and the paint on QGRY 2301. A friend called G&W the "Safety Vest Railway" and I agree. Photo notes: Nikkor 50mm f/1.8 on my full frame D800. Where do you think his apartment is? Is this why bishop has a camcorder pointed at the signals all day? Oh come on Steve, who doesn’t like watching the strippers air out at the back door while you’re waiting for a train? Nicely composed Steve. I wonder who bought the house? Probably not a railfan…. I’d like to shoot here one day too if real trains ever return. Thank god. There’s only so much of the Brantford station I can take. I think I could get a STD standing that close to the Brantford Gentlemen’s Club. So there’s one positive out of this… it keeps Host out of B’town. I’ll come back if it does. 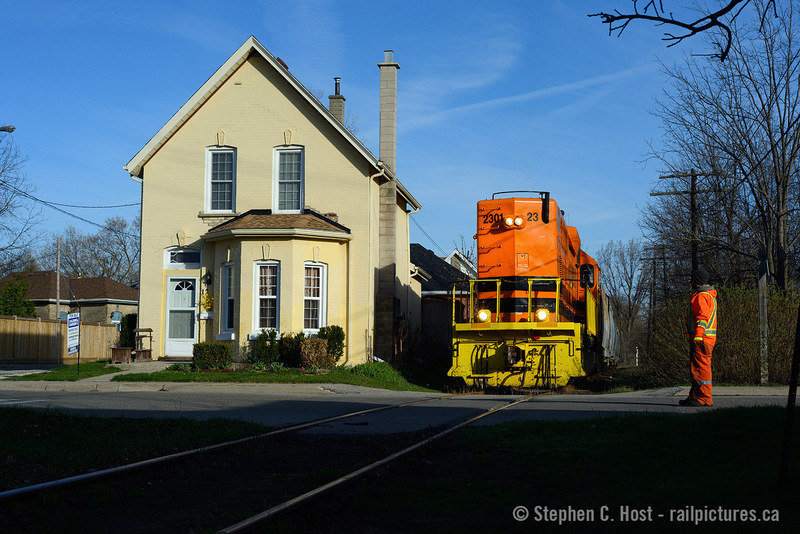 I hope one day we’ll see a locomotive passing this house again.